Arctic Bay is located in the northern part of the Borden Peninsula on Baffin Island. As of 2016, it has a population of 868. 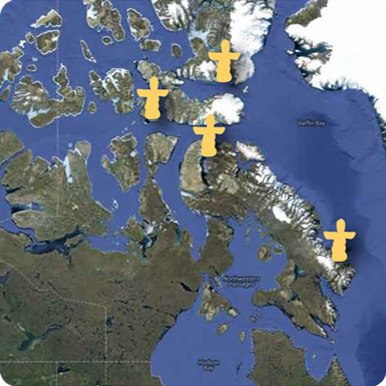 The area that is now Arctic Bay has been occupied for nearly 5,000 years by Inuit migrating from the west. Its Inuktitut name “Ikpiarjuk” translates to “the pocket” in English. The Inuktitut name “Aujuittuq” means the place that never thaws. Grise Fiord is the most northern community in AFA, located 1,160 km north of the Arctic Circle and as of 2016, is home to 129 people. The community is the northernmost civilian settlement in Canada. Qikiqtarjuaq means the “Big Island.” Located on Broughton Island, it has a population of 598 as of 2016. The island is known for its Arctic wildlife and is the northern access point for the Auyuittuq National Park. The deep waters adjacent to the island have helped make the case for harbour development to support the Nunavut offshore fishery. The Inuktitut name “Qausuittuq” for Resolute translates to “place with no dawn.” The community is located on Cornwallis Island in the Northwest Passage and has a population of 198 as of 2016. It is second only to Grise Fiord in terms of its northern location. © Arctic Fishery Alliance 2018. All rights reserved.